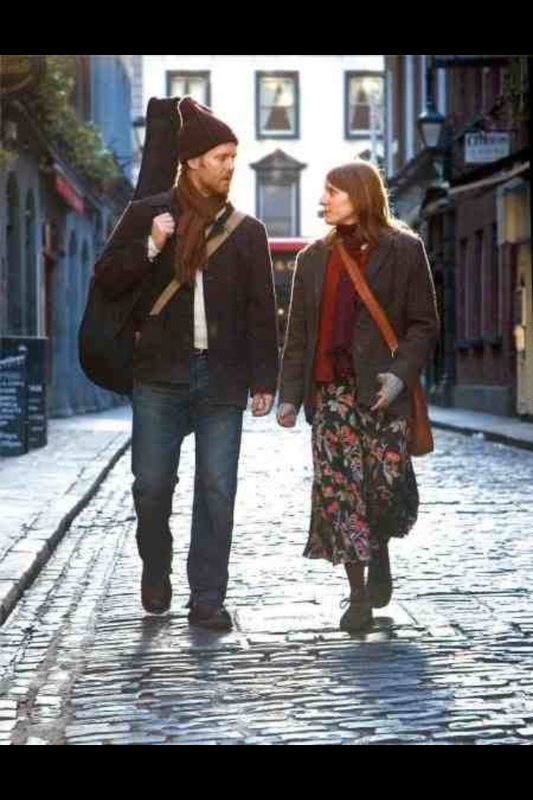 Once is a small 2006 Irish film shot for €130,000 in just 17 days. It initially came out with little fanfare but gained some high profile fans, Steven Spielberg among them and as a result found success even winning the Oscar for Best Song. This year a stage musical version opened on Broadway and the same show is now also playing in London. Apart from anything else Once is a great example of how a few people with talent, a great idea and the right opportunities can create something small in nature but huge in its success. As stories to encourage struggling artists go it is almost up there with single mother and wannabe author Joanna Rowling scratching down notes for her book on cafe serviettes because it was too cold in her flat. The story tells of two people, an Irish guy and a Czech girl, who meet under fairly random circumstances and literally make beautiful music together. It is a musical, there are songs but the whole thing is played realistically. People burst into song because they are jamming in a music shop and sing as they are walking down the street because the roads are quiet and they are listening to something on their personal stereo. It is a brilliant musical for people who don’t like musicals conventions and a brilliant film for people who do like brilliant films. The title refers to what fearful artists say when they are reluctant to go for their big break; ‘I’ll do it once I’ve done this or once I’ve done that’ but it also works in the context of the central couple and the nature of their relationship; ‘Once I met this girl who changed my life and…’ Also, was there ever a film that on the basis of its title if nothing else was crying out for a sequel; ‘Once Again’, Once More’ ‘Twice’? Both unfortunately and fortunately though this film remains a once off. You desperately want to know what happens to the characters after the end but the fact that you don’t carries a certain poetic beauty. As does the fact that the most significant line in the entire film is spoken in Czech with no translation. The guy is in total ignorance of what has just been said to him and so is most of the audience. That is what life is like, life does not come with subtitles, life has no voice over full of exposition and life does not involve impromptu singing. Life does tend to be lifelike and so does this film. This is one area in which the stage show cannot really compete so rather than trying to do so it wears its Brechtian-ness on its sleeve. Placing a huge behind the bar mirror on the stage so that the audience can see themselves in the action and inviting them onto the stage during the interval to buy drinks at that same bar are inspired staging choices. As you watch the play you are simultaneously pulled out of and drawn into the action and it makes it an intimate theatrical experience. The stage musical is no less brilliant than the film musical but interestingly, because it is already partially alienating, does come with subtitles which is the only reason why I now know what that important line really was. Both the film and the stage show are wonderful, under played gems and if you get the opportunity to see either or both you definitely should. I have deliberately tried to give as little plot detail away as I can because the less you know the better. Tagged Once, once the musical, Phoenix theatreBookmark the permalink. love love love this film. bought the CD and yes i might buy the DVD. I recall the moment out in the country when she replied to him but it was a few years ago – i did google it at the time… Not sure what u mean – does the stage show come with subtitles? Yes, that line is translated in the stage show, there are subtitles projected on the proscenium arch (or the closest thing to a proscenium arch there is on the set). I just took her translation at face value in the film. I thought this was going to be a little post that no one would read but it is about the fourth most read film post I’ve done. If it goes viral I might regret that ‘I’ll give you your money back’ thing.